That was by far the wildest night of my life. 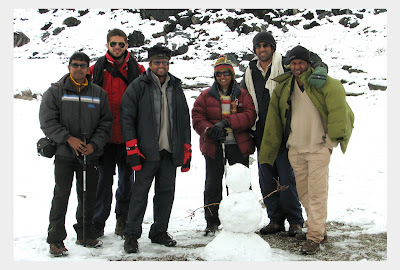 The temperature had fallen to minus ten degrees and the snowfall continued through the night. 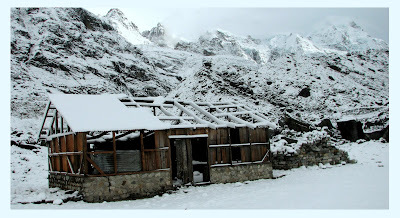 The fear that the tent might collapse on us kept us awake, tapping the roof every now and then not letting the soft snow accumulate on the top. Though it worked for a while, the snow started piling up on the sides and the metal poles holding the tent slowly started bending inwards. But it wasn't quite frightening as we slipped in and out of sleep, till we had a look at the situation the next morning. By 3 in the morning the snowfall stopped and we got out onto a carpet of soft snow. As the weather looked relatively good, we decided to walk up to Goecha La pass. The Russian contingent who were camping nearby were also getting ready for the early morning trek. By four in the morning 9 of us started for Goecha La, while the rest of the gang decided to sleep for a while more. As we started the climb in the sub zero temperatures I could feel the cold and altitude finally getting on to me. The arrogance of wearing shorts in that climate was being dearly paid for. After a 45 minutes walk we reached the other side of the hill and got the first glimpse of Samiti Lake. There was an abandoned log cabin by the lake and the whole setting looked awesome in the morning light. By then it started snowing again, this time accompanied by strong winds. As the morning sun colored the skies a dull blue, myself and Gokul decided to spend some time around the lake clicking pictures. Once the sun is fully out, the reflection from the snow is so blinding that the pictures will all be washed out. Though the intention was to resume the climb a little later, we were so captivated by the beauty of the place and finally decided to abandon the climb, a decision which proved wise as the day progressed. 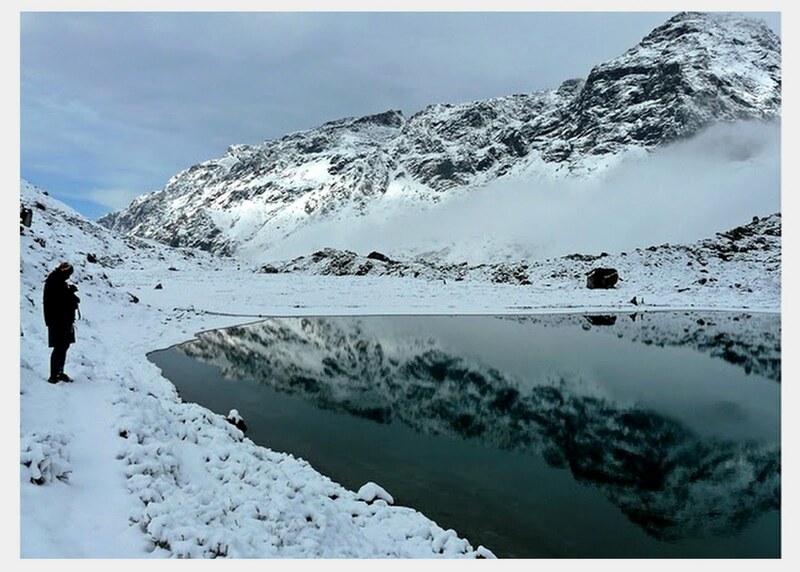 Samiti lake looked so serene and calm, bordered by snow clad peaks on all sides. Brightly colored birds flying around the shores, prayer flags fluttering in the wind, howling sound of the wind and the snowflakes together gave a special charm to the morning. We walked around the lake a few times and soon realized we were in fact walking over the frozen lake itself, carefully camouflaged under the soft snow. We soon moved towards the log cabin and started working on Snowie, the snowman. We used a biscuit packet for his nose, some branches and twigs for his arms and hair. By the time we were done with Snowie, the guys who had gone ahead also came back, the weather was so bad that they could not proceed much, though they got a nice glimpse of Kanchenjunga from another view point. We also learned that one of the ladies from the Russian contingent had severe bleeding and will have to be airlifted for urgent medical treatment. Inspite of some great protective gear (far superior to ours) and precautions, nature at times have the last laugh! By the time we walked back to the camp site the guys were all up and running and were busy making their own snowman. 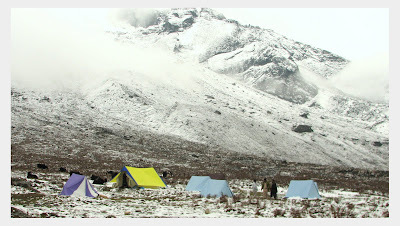 Miles and miles of white snow was all that we could see from the hilltop, with the tents looking like stray droplets of color on an otherwise blank canvas. Some of the Yaks had ran away in the night and the porters had gone to fetch them. We had some nice hot breakfast and started packing the stuff for our return journey, playing with snow all the while. By 11 we started the day's trek and after lunch at Thangshing, we finally reached the cabin at Kokchurung by 4 in the evening. This stretch was mostly through flat terrain and intermittent rains made it all the more fun. 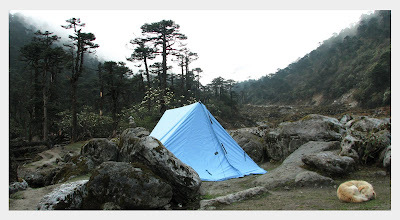 We were planning to stay inside the cabin for the night, but as it was too crowded for the 25 of us, Alfonso, Robert and myself decided to pitch a tent by the riverside. We had a terrific view of mount Pandim from there and the gushing waters of Prek Chu made it even more an experience to camp outside than in the log cabin. After setting up the tent few of us went exploring the area, the bridges, rhododendron forests and the crystal clear Prek Chu. Alfonso wanted to take a dip and it took just about 35 seconds for him to get out of his clothes, take a dip and get back inside them! Perched on the rocks outside the tent, with 'Almost Dusty' for company, I took out my harmonica and played a few tunes to my heart's content. The feeling you get as the sound waves reverberate through the valleys and the pine forests, is something my limited vocabulary is incapable of reproducing. We had started our return journey, but it was far from over yet. After some hot rice and rice kheer we all went to sleep, happy and contented at a mission almost accomplished! Wow! This place looks amazing. Quite a lake at such an altitude. loved reading this blog. we have planned for the same, this february. and after reading this, i guess this is going to be even more tough.